Northern New Jersey, which straddles a significant ancient crack in the Earth’s crust known as the Ramapo Fault, recorded 16 earthquakes last year, an unusually high number for the area. It had been relatively quiet this year, until geologists recorded a 1.3 magnitude quake last weekend in Morris Plains, and then a 1.0 magnitude quake Saturday in Morristown. Last weekend’s tremor was reported by Columbia University’s Lamont-Doherty Observatory to the Morris Plains Police Department, which issued an advisory to residents on Monday morning. Lamont-Doherty spokesman Kevin Krajick said the quake was pinpointed to a shallow depth of 6 kilometers just north of Grannis Avenue, between Mountain and Sun Valley ways, about 500 feet southeast of Mountain way School. “To date (there) were no reported injuries or damage related to the earthquake and no Morris Plains residents reported any activity to this agency,” according to Morris Plains police Chief Jason Kohn. .Earthquakes are generally less frequent and less intense in the Northeast compared to the U.S. Pacific Coast, according to the New Jersey Department of Environmental Protection. But due to geological differences between the regions, earthquakes of similar magnitude affect an area 10 times larger in the Northeast compared to the West Coast. The 16 tremors recorded in 2016 were minor, generally 1 or 2 magnitude, often misinterpreted as explosions, said Alexander Gates, geology professor at Rutgers University Newark campus. “A lot of people in Butler felt them over the course of the last year, but a lot of them didn’t know it was an earthquake,” Gates said. Butler is the borough, but also the name of the fault that sits at the end of aseries of others belonging to the Ramapo Fault, Gates said. The Ramapo fault, Gates said, is the longest in the Northeast and runs from Pennnsylvania through New Jersey, snaking northeast through Hunterdon, Somerset, Morris, Passaic, and Bergen counties before coming to an end in New York’s Westchester County, not far from the Indian Point Energy Center, a nuclear power plant. The small area, Gates said, is considered the most seismically active region east of the Mississippi based on data gathered since 1974, when seismographs were installed. “I’d be willing to bet that you’d have to go all the way to Canada and all the way to South Carolina before you’d get one that active,” Gates said of the area which runs from the New York state line in the Ringwood and Mahwah area down to Butler and central Passaic County, Gates said. Of last year’s 16 earthquakes, 12 were directly associated with the faults around Butler, Gates said. Butler Councilman Ray Verdonik said area residents are well aware of the frequency of earthquakes and agrees they are often difficult to discern. During one earthquake, the councilman said he and his neighbors rushed from their homes. “We thought it was from Picatinny Arsenal or a sonic boom.” he said. Won-Young Kim, director of the Lamont-Doherty Cooperative Seismographic Network, which monitors earthquakes in the Northeast, said often very shallow, the low magnitude quakes’ waves cause much ground motion. He said even though the waves don’t travel very far, they can seem more intense than the magnitude suggests. They may not topple chimneys, he said but can crack foundations and frighten residents. To put earthquake magnitudes in perspective, experts said each year there are about 900,000 earthquakes of 2.5 magnitude or less recorded annually by seismograph. These mild tremors are usually not felt. There are 30,000 that measure between 2.5 and 5.4, and these are often felt, but cause minor damage. About 500 quakes worldwide are recorded between 5.5 and 6 magnitude per year and cause slight damage to buildings and structures. The 100 that fall within 6.1 and 6.9 may cause lots of damage in populated areas. The 20 or so which fall within the 7 and 7.9 magnitude per year are considered major and cause serious damage. Those that measure at 8 or greater can totally destroy communities near the epicenter and average one every five to 10 years. The earthquake recorded in Mexico last week measured 7.1 magnitude. Gates said he has identified most of the region’s numerous faults, but has yet to name them all. Among the unnamed include the faults responsible for last year’s quakes in the region. Earthquakes in this region are intraplate ones, Gates said, meaning they occur within the plates. Earthquakes of this type account for more than 90 percent of the total seismic energy released around the world. Plates are the masses of the earth’s crust that slowly move, maybe as little as a few centimeters a year to as much 18 centimeters, around the globe. Faults such as the San Andreas are interplate and occur near where two plates meet. The plate North America rides upon runs from the Mid Atlantic Ridge to the Pacific Coast. The theory is that as plates interact with one another, they create stress within the plate. Faults occur where the crust is weak, Gates said. Earthquakes relieve the built up pressure. Boston College Geophysics Professor John Ebel said he and a Virginia Tech colleague, believe the seismically active areas in New York and South Carolina are where some 200 million years ago, the plates tried to break off but failed. This led to a weakening of the earth’s crust which makes them susceptible to quakes. While not predictable, the data collected seem to suggest earthquakes occur somewhat periodically, 40 active years followed by 40 less active, Gates said. You never know which grain will cause the table to break, he said. Still all three experts say statistically it is only a matter time before a magnitude 5 quake is recorded in the northern New Jersey area. The scientists said quakes in the Northeastern part of the United States tend to come 100 years apart and the last one was recorded in 1884 believed to be centered south of Brooklyn. It toppled chimneys and moved houses from their foundations across the city and as far as Rahway. Washington D.C. experienced a 5.8 magnitude quake in 2011, which was felt in the Northeast, Gates said. That quake cracked the Washington Monument. A similar quake was recorded in 1737 in Weehawken, Gates noted. The threat though, is not tangible to many, Armbruster wrote. “There is no one now alive to remember that last one, so people tend to forget. And having only a partial 300-year history, we may not have seen everything we could see. There could be surprises — things bigger than we have ever seen,” Armbruster wrote. The Earth Institute’s article did note New York City added earthquake-resistant building codes in 1995. New Jersey also began to require earthquake-resistant standards in the 1990s. The state, following the 2011 Virginia quake, now requires lake communities to make dams able to withstand a magnitude 5 earthquake. The issue, Gates said, is that many of the buildings were built before these codes went into effect. A “sizable” earthquake could cause much damage. Then there’s the prediction that every 3,400 years this area can expect a quake at 7 magnitude. According to the Earth Institute article, a 2001 analysis for Bergen County estimates a magnitude 7 quake would destroy 14,000 buildings and damage 180,000 in that area alone. Likewise, in New York City the damage could easily hit hundreds of billions of dollars. Ebel noted that depending on the depth and power of a severe quake, damage could be also be wide ranging. In 2011, Washington D.C., 90 miles away from the epicenter, which was located in central Virginia, suffered significant damage. Cities like Philadelphia fall within that radius. “The big one could happen tomorrow or 100 years from now. That’s the problem,” Gates said. It geological terms 100 years is just a spit in the ocean, he noted. Then again North Jersey is more likely to be hit by hurricane in the next three years, Gates added. Staff Writer William Westhoven contributed to this report. • Dec. 19, 1737 — Weehawken, believed to be a 5-plus magnitude quake, could be very serious if occurred in same spot today. • Nov. 29, 1783 — Western New Jersey. Geologists are not exactly sure where it happened because area was sparsely populated. Estimated magnitude varies from 4.8 to 5.3. Felt from Pennsylvania to New England. • Aug. 10, 1884 — A 5.2 earthquake occurred somewhere near Jamaica Bay near Brooklyn. The quake toppled chimneys and moved houses off their foundations as far Rahway. • New Jersey has never recorded a fatality due to an earthquake, according to the DEP. It’s no secret that the US and Russia spent much of the 20th century devising hideously elaborate ways of blowing each other up. Now declassified documents written in 1964 have revealed the true extent of the apocalyptic atomic broadside Washington planned to unleash against its greatest enemy. A pair of top-secret memos written by top military chiefs shows the US was intending to implement an ‘overkill’ strategy which would have flattened Russian cities and killed tens of millions of people. They demonstrate how generals were considering the possibility of unleashing thousands of nukes in a bid to cause ‘95% damage’ to targets such as military facilities and ‘urban-industrial centres’ including major cities. The files also document plans to blow up 30% of all the people living in 30 Chinese cities, saying this outcome would be ‘desirable’. The secret files were unearthed by George Washington University’s National Security Archive and shed light on a secret nuclear strategy called the Single Integrated Operational Plan (SIOP), which is often referred to as a ‘doomsday machine’ and has never been declassified. Researchers are only able to learn about this highly disturbing scheme by reading other documents which discuss it, meaning the release of the two memorandums is a major step forward in understanding the grim fate which would have befallen the world if a nuclear war erupted. ‘US nuclear war plans [made] during the Johnson administration included the option of a retaliatory strike against nuclear, conventional military, and urban-industrial targets with the purpose of removing the Soviet Union “from the category of a major industrial power” and destroying it as a “viable” society,’ wrote the National Security Archive in a statement. ‘The document, the Joint Staff’s review of SIOP guidance in June 1964, showed continued acceptance by policymakers of the cataclysmic nuclear strike options that had been integral to the plan since its inception. Accordingly, the SIOP set high damage requirements – 95% for the top priority nuclear targets – ensuring that it remained an “overkill” plan, referring to its massively destructive effects. The latest declassified document is a review of SIOP conducted by the Joint Staff, a group of senior military leaders. It lays out plans for retaliatory and preemptive strikes against Russia or China which range in severity from an assault aimed at knocking out nuclear weapons facilities to a blitzkrieg designed to ‘destroy the will and ability of the Sino-Soviet bloc to wage, remove the enemy from the category of a major industrial power and assure a post-war balance of power favourable to the United States’. The plans also expose a scheme to use ‘population loss as the primary yardstick for effectiveness in destroying the enemy society with only collateral attention to industrial damage’, the National Security Archive added. What this means is that the US was willing to bomb Russia back to the Stone Age and viewed the destruction of its population as a valid strategy of war. China & Russia Set a Nuclear Collision Course With the U.S.
Too costly to contemplate? Unfortunately, assessments like these, often heard in U.S. policy circles, can embolden the already arrogant Chinese and make their adventurism—and war—more likely. Moreover, any conflict between China and the United States in the Pacific could quickly escalate to nuclear war. China, surpassing the U.S. last year, now boasts the world’s largest navy, and it is adding to its fleet “at a stunning rate,” according to the Times. Even last year, the count was lopsided with China claiming 317 surface vessels and subs in active service and the U.S. 283. Of course, it’s not clear how capable the People’s Liberation Army Navy is. The PLAN, as it is known, has never participated in a large-scale wartime engagement at sea, and its fleet is not, on the whole, as modern as America’s. Nonetheless, China has a few critical advantages. Its naval assets are concentrated along its shores and U.S. forces are spread around the globe; areas of likely conflict are near China and far from America; and the PLAN has some crucial weapons that are better than those of the United States, especially anti-ship missiles. Beijing has also gone big into “asymmetric” warfare, for instance militarizing fishing fleets, enlisting the “little blue men” of what has become a maritime militia. The Chinese also have one other advantage: the will to use force to take what is in the possession of others. In their peripheral seas, they grabbed control of the Paracel Islands, in the northern portion of the South China Sea, from South Vietnam in 1974 after a short battle. The Chinese also seized Mischief Reef from the Philippines in a series of actions from late 1994 to early 1995, and they snatched Scarborough Shoal, also from Manila, in early 2012. Now, China is, among other things, pressuring other Philippine features in the South China Sea and using menacing tactics to take over a chain of uninhabited islets currently under Japanese control in the East China Sea. Moreover, Beijing has clearly relished challenging the U.S. Navy and Air Force in the global commons, threatening and on occasion harassing American ships, planes, and drones. The seizure of an American drone in international waters in December 2016, in sight of the USNS Bowditch and in defiance of radio commands, was brazen and nothing short of an act of war. Moreover, Beijing’s harassment of the USNS Impeccable in March 2009 in the South China Sea, using its maritime militia, was so severe that it constituted an attack on the United States. Avigdor Lieberman, Israel’s defence minister, signalled on Monday it would “contend” with Iranian provocations wherever they are found. „We are certainly monitoring everything that is happening in Syria, and regarding Iranian threats we are not limiting ourselves just to Syrian territory. This also needs to be clear,“ Mr Lieberman told a conference in Jerusalem. “I’d also bet this would worry them more if that also means there’s the possibility of continued and more advanced weapons transfers,” he said. “Tehran’s continued provocations and violations of Israel’s stated red lines are fueling an escalatory spiral that has the potential to rapidly spin out of control,” he wrote. Iraqi politicians led by cleric Moqtada al-Sadr and Prime Minister Haider al-Abadi say they have created an alliance that would give them a majority bloc in the new parliament after four months of political uncertainty. The new government is tasked with rebuilding the country after a three-year war with Islamic State militants and balancing relations between Iraq’s two biggest allies: arch-rivals Iran and the United States. The alliance announced on Sunday includes 177 politicians from 16 electoral lists, a document published by the state news agency showed. It is now in the lead position to form a government. 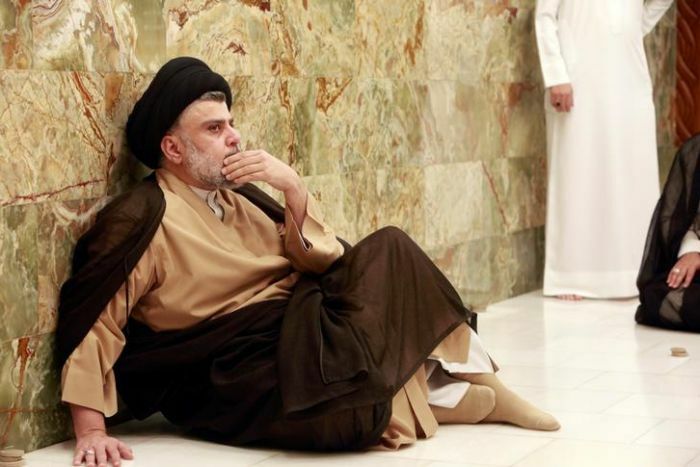 Once targeted by a US kill or capture order, the nationalist Shiite cleric shocked many with his victory in the Iraq election. Here’s what we know about the new leader. The recount delayed the process by three months but showed little had changed from the initial results, with Mr al-Sadr, a populist Shiite cleric, retaining his lead of 54 seats. Mr Abadi’s bloc remained third with 42. The new alliance includes the blocs of Vice-President Ayad Allawi and Shiite Muslim cleric Ammar al-Hakim, as well as several Sunni Muslim politicians and ones representing Turkmen, Yazidi, Mandaean and Christian minorities. Since Saddam Hussein was toppled in a 2003 US invasion, power has been shared among Iraq’s three largest ethnic-sectarian components. Media player: „Space“ to play, „M“ to mute, „left“ and „right“ to seek. VIDEO 0:31 Cleric Moqtadr al-Sadr’s alliance with communists and secular Iraqis fiercely opposes any foreign interference in Iraq. The current prime minister is a Shiite Arab, the speaker of parliament a Sunni Arab and the president a Kurd. Also absent is a political bloc led by militia commander Hadi al-Ameri made up of Shiite paramilitary groups that came second with 48 seats and that of former prime minister Nuri al-Maliki, who came in fifth with 25. Mr Ameri and Mr Maliki are Iran’s two most prominent allies in Iraq. The past few days have seen Mr Sadr and Mr Abadi on one side racing to form a majority before Mr Ameri and Mr Maliki were able to do so. Politicians allied with Mr Ameri and Mr Maliki have suggested the announced majority might fall apart and hinted at imminent defections to their camp. PHOTO Protesters flee as security forces disperse them from the provincial council building on Sunday. The alliance comes amid growing unrest in southern Iraqi cities over poor public services and corruption. Police had to use tear gas to disperse around 150 protesters at the main entrance to Iraq’s giant Nahr Bin Omar oilfield on Sunday. On Friday, hundreds of Iraqi protesters stoned and tried to break into the provincial government headquarters in the southern oil hub of Basra demanding better public services and an end to pervasive corruption. Around 3,000 people gathered there again on Sunday and set fire to tyres outside. Protesters threatened to break into the field if the government did not respond to their demands to improve basic services and address their complaints over Basra’s drinking water, which residents say is undrinkable due to high salt levels. „We will not allow the oilfield to operate unless we get clean water. No services, no jobs and now no clean water. We are fed up,“ said Hassan Ali, a protest organiser. Oil exports from Basra account for more than 95 per cent of Iraq’s state revenues. Any potential disruptions to production could severely impact Iraq’s limping economy.